After arriving at Central Presbyterian Church in Ft. Smith for the Arkansas Presbyterian Women's Spring Gathering, my friend and I were offered a delightful continental breakfast prepared by the ladies of the church. You can always be assured of good food when the women of any church are doing the cooking! The presentation of each recipe was beautiful. To my surprise and delight, one of the main dishes presented in a large decorative glass casserole dish was a yogurt parfait. 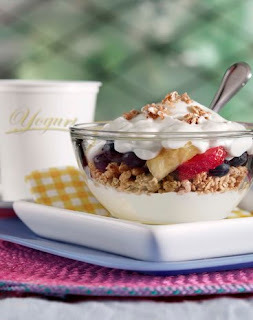 The yogurt was layered with blueberries,strawberries,raspberries,and peaches and topped with granola. It was delicious and a great idea for serving a crowd with a nutritious and tasty dairy recipe. If you need a quick breakfast for yourself or a special treat for your family for Easter, you may want to try Easy to Please Yogurt Parfait! To assemble parfait,begin with spooning half of the yogurt in the bottom of a bowl or tall glass. Add 2 tablespoons cereal and 1/2 cup fruit. Spoon on the rest of the yogurt. Top with remaining 2 tablespoons of cereal. Substitution Ideas: Use any favorite flavor of yogurt as a base. You can also substitute canned fruit(drained) for fresh fruit. You can find a variety of yogurt recipes at http://midwestdairy.com/. Have a dairy good week!